Last year the main square of The Hague saw a lively addition to its city dynamic by Belgian designer Sebastien Wierinck. Wierinck was commissioned by the City of The Hague to create BenchMarks in 2010, as part of the town’s actions to promote their application for the European Capital of Culture label in 2018, which included the rehabilitation of Spuiplein, the main square. His project was chosen by the municipality with the support of arts and design consultants Stroom Den Haag among three other proposals. Wierinck’s direct intention with BenchMarks, an installation that consists of three benches made from freeform bent tubes of stainless steel, was to design dynamic structures that challenge users and create different experiences. This same intent has outlined the designer’s work since he created his own label, OnSite, in 2002. According to Vincent de Boer, Art and Public Space Advisor at Stroom, ‘Spuiplein needed a heart. The benches bring a softness and an openness to this space. People can relate to the objects in many different ways: sit down, lay back, look around and play… This playfulness was very important to us, and the benches are already proving popular with the people of The Hague’. Ever since the foundation of OnSite you have been working with the tubular form. How did this concept come about? Sebastien Wierinck: The idea is quite simple, I think we are all involved in the process of creation, so we are searching for solutions to express our creativity. I didn’t just use tubes, but corrugated plastic tubes that are normally used to create underground networks. When Marcel Breuer and Mart Stam used metal tubes to create furniture, these came from the plumbing and gas industry. They hacked a technological process and used it for furniture design to create an object related to industrialization and standardization – an important theme of the Modernist movement. The tubes I use in my work come from communication networks. Besides their technical advantages, I mainly use them as a medium to express something about our society: digitalization and individualization. The material is the message. For this reason the tube acts like an ‘ism’, a conceptual, artistic and technical framework I use to translate ideas and materialize situations. What were the main goals of OnSite when the project was founded? Have these changed after 11 years? S.W. : OnSite was created with the idea of interpretation/transformation. An unstable system that could find a shape in multiple situations. All my works use this as a design strategy: never design objects, design variable systems. It’s one of the fundamental elements that still remains. On the other hand, it just took 10 years to have a permanent work in a public area. Even if I still appreciate the freedom you may find by building ephemeral things, there comes a time you want things to be fixed. This is now an issue. What inspired your BenchMarks for The Hague? S.W. : In 2008 and 2010 I built a temporary bar and lounge installation for the TodaysArt festival meeting point on Spuiplein, The Hague, where the BenchMarks are now located, so when I started this project I had already experienced the place and its users. At that time I was also investigating technical solutions for the upgrade of my tubular works and came across a research project done by the CAAD department at ETH Zurich. They had been experimenting with robots used in the auto industry to bend complex curves. They also created a script to easily program and optimize the bending of variable curves following complex paths. ETHZ introduced me to Tom Pawlofsky who runs their robotic research department, who helped me to find a bending producer in Switzerland. With the technological skills on one side and the knowledge of the area on the other side, I started what I call the ‘programming’ of the objects. Although sitting down is seen as a rather passive act in itself, we tried to identify various reasons for this action. We decided that each bench would act as a satellite for one of the square’s surrounding landmark buildings. Each one aims to create a different type of interaction with its users (see images and captions above). 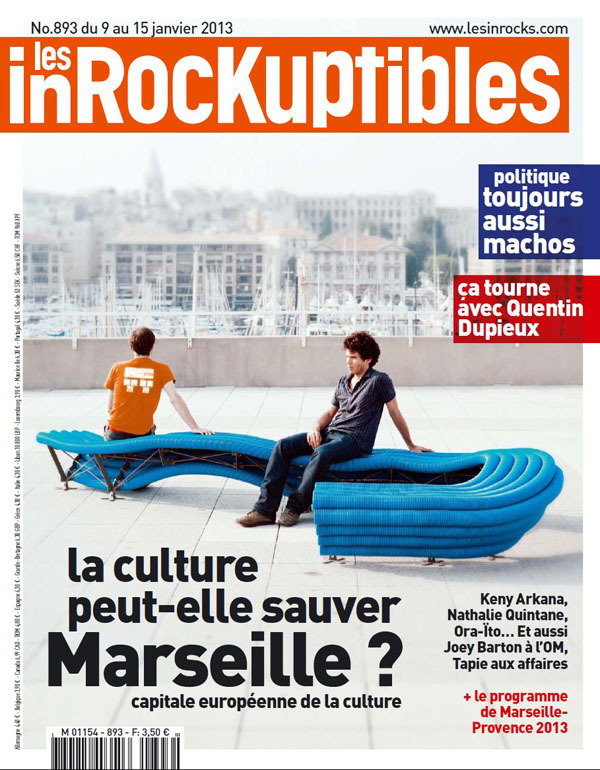 What is happening in Marseille, 2013 European Capital of Culture? S.W. : Marseille has been struggling since the 1970s. It’s the oldest French city and the second largest one after Paris. It’s a Mediterranean harbor that lost [business] with the independence of the French Algerian colony, their main economic activity. Marseille 2013 ECC is a label used to give the city another dimension. They want the Bilbao effect and the Lille 2004 results. For example, they are building a beautiful MuCem by French architect Rudy Ricciotti. How will you be involved in Marseille 2013 ECC? S.W. : Till today, and unless something happens, I will not be part of the Official program, which is a real frustration. But as a citizen of Marseille I can use the ‘collateral damage’ of this situation, the dynamic that is generated. It’s through this dynamic that people labeled OFF decided to build a temporary infrastructure to accommodate visitors during their stay in Marseille. There are no camping sites in Marseille, so we decided to build one, but more or less like an temporary experimental village. OnSite 02 published in french national magazine Les Inrockuptibles to illustrate the European Cultural Capital of 2013, Marseille. So, this is already one more good reason to come and visit us! The Camping , the most interesting unofficial project. INSPIRED. Bistro 16 By Sebastien Wierinck from GREY GOOSE RUSSIA on Vimeo.